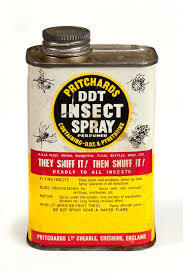 (Beyond Pesticides, February 20, 2019) Women exposed to DDT during ‘early windows of susceptibility’ in their childhood are at increased risk of developing breast cancer, according to new research published in the Journal of the National Cancer Institute. Nearly 75 years after the chemical was first used in the U.S., and 50 years after its ban, DDT is continuing to adversely affect the health of Americans. The data brings needed attention to the dangers of early-life pesticide exposure, and underlines the need to take a precautionary approach to the introduction of biocides in our environment so that future generations do not suffer from the same mistakes of the past. PHI and Dr. Cohn’s research has followed over 15,000 women for nearly six decades of life, tracking participants’ body burden (the amount of chemical contamination measured in an individual) of DDT in their blood at first exposure, during pregnancy, and if diagnosed with breast cancer. Researchers identified 153 individuals diagnosed with breast cancer from state records. Then, using data on exposure levels collected during pregnancies from 1959 to 1967, each diagnosed woman was matched up with up to three women enrolled in the study who did not develop breast cancer (in order to provide a control variable). “Even though there have been many studies of the environment and breast cancer, only a very small fraction have actually measured environmental exposures during windows of susceptibility, in this case in early infancy and prior to menarche,” said study author Mary Beth Terry, PhD, Professor of Epidemiology and Environmental Health Sciences at the Mailman School of Public Health at Columbia University and the Herbert Irving Comprehensive Cancer Center. “The studies that have measured environmental exposures during windows of susceptibility, like our study, are much more consistent in supporting a positive association with breast cancer risk,” said Dr. Terry. As this study reveals, exposure to pesticides as children are developing can result in a higher risk of disease later into life. Unfortunately, researchers can only determine these impacts in hindsight through epidemiological studies. While DDT is the poster child for this concern, other ‘legacy’ chemicals –unnecessarily still in use – are emerging as modern contenders. Glyphosate for example, first registered as an herbicide in the early 1970s, has now accumulated significant data on its carcinogenicity. Paraquat, first registered in the 1960s, is now strongly linked to the onset of Parkinson’s disease. And linuron, also registered in the 1960s was only recently shown to be associated with the development of Multiple Sclerosis. These are only snapshots of the range of science that continues to accumulate linking pesticide exposure to the development of disease later in life. These studies, and the predictable lag time between exposure, health impacts, and epidemiological data on those impacts should lead lawmakers and regulators to consider taking a more precautionary approach to the introduction of these chemicals into the environment. Beyond Pesticides has long advocated for an alternatives assessment in the registration of pesticides. The alternatives assessment approach rejects uses and exposures deemed acceptable under the current model of evaluating pesticides when there are available alternatives available to manage insect and weed issues. For example, in agriculture, where data shows clear links to pesticide use and cancer, it would no longer be possible to use hazardous pesticides when there are organic systems with competitive productivity. Support a precautionary approach and system of food production that eschews toxic pesticides as a regular course of action by buying organic whenever possible, particularly for young children with growing bodies more susceptible to chemical exposure. Read more and help spread the word about the hazards pesticides pose to children through our Children and Pesticides Don’t Mix fact sheet. This entry was posted on Wednesday, February 20th, 2019 at 12:00 am	and is filed under Agriculture, Breast Cancer, Children, DDT, Endocrine Disruption, Glyphosate, Linuron, Paraquat, Uncategorized. You can follow any responses to this entry through the RSS 2.0 feed. You can skip to the end and leave a response. Pinging is currently not allowed.